The fishing exploded near the end of the month. The water is clearing well after much summer rainfall, the floating grass is improving, and the water temps are dropping nicely. 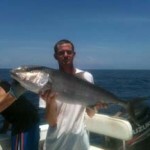 Most of the excitement has been offshore, with huge catches of grouper and amberjack in 50 to 70 feet of water. The inshore bite has also picked up, with easy trout limits, especially north of the river near the Bird Rack. Redfish are around, and some nice bulls have been caught near offshore bars and some smaller solos inshore but the large schools will be appearing over the next few weeks. We’ve also had some great Spanish mackerel action recently around bait pods, especially near the inshore sand bars north of the river. I’ve included some recent catches below. Always one of the best fishing months of the year, things will be fantastic this month. Gag and red grouper are open, along with amberjack, and the hot bite at the end of September will only get better. Bottom fishing in 40 feet and deeper over hard and Swiss cheese bottom will be most productive, and bottom fishing with live or dead bait will give you the best chance of landing your limit. However, with the cooling of the temperatures, don’t forget that when the bite slacks off, you can locate fish by trolling diving lipped plugs over mixed and hard bottom areas. Trolling between numbers may locate some new areas to bottom fish as well. Amberjack will be on structure and they have been ravenous and will offer you a strenuous workout and some fine eating as well. 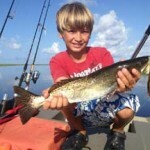 Inshore, the trout are moving onto the grass flats from deeper water. Fish in 3 to 6 feet of water with popping corks and jigs with live, Gulp or DOA shrimp. Try to entice a few larger fish by using some live pinfish under corks in deeper water. When the bite slows, you can try some pinfish filets under corks as well. 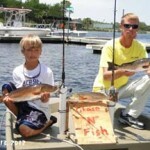 Redfish will begin schooling for their migration offshore. These are the largest immature fish, and many will be overslot fish of up to 30 inches. Look carefully in shallow water for evidence of schools. Move in slowly and quietly, and if there is one most important aspect of fishing inshore redfish, it’s the presence of baitfish, especially mullet. We frequently scan the shoreline from a quarter mile offshore with binoculars to look for baitfish activity in areas outside of creek mouths. Schools will tend to be 200-300 yards offshore, while solitary fish are more likely to be right along the shoreline, hugging the grass and rocky areas of structure. Another key is looking for rock grass, a kind of sargassum that only grows when attached to rocks. 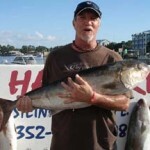 There are areas of large fields of rock grass, which usually holds pinfish and other baitfish, so fish those areas. If you fish artificials, use topwaters such as the Super Spook Junior or Skitterwalk. With no activity, switch to suspending lures or small crankbaits such as the Heddon Swim’n Image. There are lots of alternatives, including jigs and soft tails and gold spoons to cover a lot of water. In areas of structure, anchor and fish live or cut pinfish. These fish move in and out with the tides so sometimes it’s a matter of being at the right place in areas that you know have held fish in the past. Take advantage of October’s excellent redfishing. Most importantly, stop by the Sea Hag Ship’s Store for the latest updates, and to pick up live pinfish or shrimp. We’ve recently updated our great selection of artificial lures, soft plastics, terminal tackle, and frozen bait. We also have a great selection of rods and reels in any price range, and can refill any of your reels with fresh line, mono or braid.